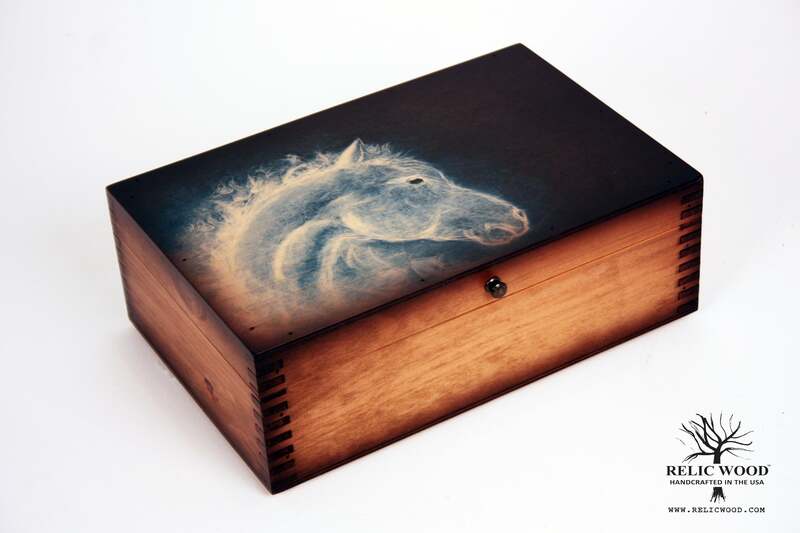 Blue Fire Horse Memory Gift Box – The highlighted artwork on top features a regal horse. A vintage gift that is perfect for anyone who loves horses. This wooden box is complete with a stylish knob handle and offers the perfect storage place for keepsakes. Great for decorating your home. Up to 75 characters spanning three lines. Please enter text on maximum of three separate lines & double check your spelling . . . We engrave exactly what you enter. We will size the font to fit. Add Black Felt to Inside Lid? Upgrade to black felt on the inside lid. Pin awards, pictures, etc. Blue Fire Horse Memory Gift Box – The highlighted artwork on top features a regal horse. A vintage gift that is perfect for anyone who loves horses. This wooden box is complete with a stylish knob handle and offers the perfect storage place for keepsakes. Beautiful antiqued artwork is embedded into the wood then lacquered over top to ensure it resists damage from scratches. We believe our blue fire horse wooden memory box is a testament to America’s great history of producing quality products that are meant to last . . . and that is how we still do it today! Our boxes are made in the USA and make great gifts that can beautifully decorate any home.